So first things first… everybody wants to see how the vests and apparel look when they inflate, so take a quick look at the video it inflate! (Note: The features shown in the video are of a slightly different version, so disregard any minor differences in what you see in the video and what you see in the pictures). About the Adventure jacket: Here the complete adventure riding package complete with Helite airbag technology! This is a 3/4 length shell jacket that is favored by adventure and touring riders. 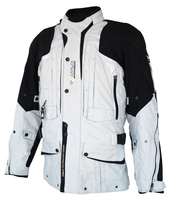 Longer jackets like this have much more options for storage and give more coverage of the body which adventure riders like. Check out the photos of the storage options… there are plenty of pocket on the front, one big one on the back and more inside. The air bag mechanics are neatly stored away in one of the chest pockets, so the casual observer won’t be able to see this is an air bag jacket except for the lanyard connector on the front chest. The shell of this jacket is a solid textile design and it also has some venting capability through zippered venting. I’d say the zip venting is “moderate” in capability when compared to other textile/adventure styles like this, so it will well for mild weather… maybe even warm weather, but I don’t think it will be comfortable in hot summer months. However this jacket should do great in colder weather. It will be windproof with all the zippers closed up and it even comes with a removable thermal vest to add a layer of insulation. The Adventure jacket comes with a set of CE molded armor in the shoulders and elbows and then it includes the same CE level 2 back pad armor as all the other Helite vests and jackets, so there is nothing else to buy.